It’s here! It’s happened! It’s release day!!!!!! 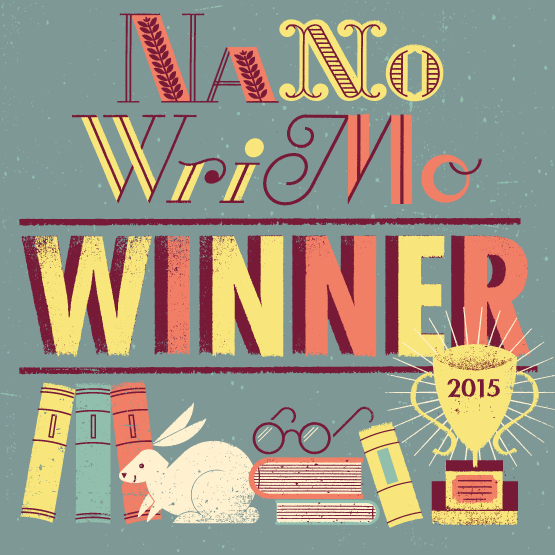 Hey, and if you maybe want a free copy of Ariah, well, shoot, why not enter this giveaway? It’s open until midnight this Saturday! ARIAH Countdown: Excerpt & Giveaway! We’re a mere two days out from release day! If you’d like a sneak peak of Ariah, I’ve posted the first chapter here for free! If you like what you read, enter the giveaway! Two lucky entrants will win a free ebook of Ariah! The giveaway closes midnight, Saturday 6/30, so enter now for your chance to win! There are times I still have nightmares about that first day in Rabatha. I’d come from Ardijan, which is a small place built around the river and the factories. It’s a town that is mostly inhabited by the elves who work the factories with a smattering of Qin foremen and administrators. We outnumber them there. We’re still poor and overworked, we still get hassled, but there is a comfort in numbers. It was a comfort so deeply bred in me that stepping off the train in Rabatha was a harrowing experience. The train, a loud, violent thing that cloaked half the city in steam, plowed right into the center of the city and dropped me off only three streets away from the palace. Even with all the steam, I could see its spires and domes. Even with all the commotion, I could hear the barked orders and vicious slurs of the Qin enforcement agents. I was searched. My single bag of clothes and books was searched. Everything I had brought with me except my citizenship papers was confiscated, including what little money I had. I was one of exactly seven elves on that train, and all of us were detained, and all of us were robbed. On the train, the seven of us had shared a single compartment. I knew, intellectually, that the train was full of Qin people, but I was with my own, like I had always been, and the nearness of that truth was lost on me. The train station was a sea of brown skin and fangs. I came to Rabatha for training, and as is traditional I came to my mentor on my thirtieth birthday. Thirty is when we consider a child to be grown. Before I got on that train, I felt grown. I felt adult. I felt ready. But when I looked around and saw no one who looked like me, it scared the thoughts right out of my mind. I was thirty, but I felt like a child. So it was that I arrived alone in Rabatha, penniless and empty-handed. I arrived and had the securities of my youth brutally ripped away. I also arrived in the mid-afternoon, with only a few hours before curfew to find the man who would be my mentor. My parents had made me commit his address to memory, which had been good foresight, but the shock of the train station drowned the memory of it. All I knew was that he lived in the Semadran borough, and the Semadran boroughs inevitably sprang up on west side of town. That’s where the Qin like us to be. They know that magic in the westlands is stronger than in the east, and so they prefer to live east of anything and everything. I went west. I got to the borough without incident, though the walk took three hours. I was born in the summer, so it was a miserably hot day. I thought I’d die of thirst, but I wasn’t brave enough to ask anyone for water, not even other elves. I never found his place. No matter how hard I wracked my brain, I couldn’t remember the address. He found me. The borough in Rabatha is cramped—it houses twice as many elves as Ardijan, in half the space—but Semadran boroughs are alike all over. The center had a schoolhouse. Elvish homes were planted around it in ever-widening circles, all facing outward, like sentries. When you are Semadran and you are lost, or hurt, or in need, you find the schoolhouse, and eventually what you need finds you there. I made it to the schoolhouse a little before dusk fell, just when the streets were beginning to empty. I sat on the steps, cowering in the schoolhouse’s shadow. It was a stately building, two floors tall with real glass windowpanes. I don’t know how long I sat there. My mind was numb, my body was sore; I was tired inside and out. I hated everything about everyone. I was well-entrenched in these thoughts, the arrogant and bitter thoughts very young men think, when my mentor found me. “Are you Ariah?” he asked. I looked up. I didn’t know whether or not to answer him. I didn’t know before then that Dirva was not fully Semadran. I am certain my parents didn’t know. My father likely would not have cared, but it would have been a deal breaker for my mother. It would have been hypocritical of her, but she had her standards, and she stuck to them. I have always felt conspicuous. I have always been conspicuous. There is red blood in my family, and red blood rises to the surface. Both my mother and I have her mother’s green eyes. My mother even has freckles. I just have the green eyes; everything else about me is appropriately silver. My green eyes had always been an ambivalent thing for me. My father loves them, loves difference. My mother thinks them a curse. It is true that she and I got strange looks, that there were children growing up who were encouraged to play with boys other than me. And it’s true that some sought me out, curious and fascinated. As I said, I was very young then, and I had not yet lived enough or grown enough to know really how I felt about my diluted blood. When you’re very young and you’re different, you begin to believe that no one has ever been as different as you and that no one has ever felt that difference as keenly as you. But there was Dirva. He was a tall man and broad-shouldered, a big man. He was a dark man, with skin a deep, deep gray, nearly black. And his hair was the same color—inky black. His eyes were green, like mine, but they were green in a vibrant and forceful way, the pupils a hair too small and the irises a hair too wide. He had whites in the corners of his eyes. He was a man with blood a far sight more muddled than my own, a man who looked like he had at least a dash of mundanity in him. His blood was so muddled that my mother’s suspicions took root. I didn’t answer. It was the strangest thing, but I felt when I saw him that I’d seen him before. I knew I hadn’t, but I felt it anyway. It made me trust him less. There was nothing to do but take his hand. I was there in that unknown city, alone, with no money. I could not have gotten back to Ardijan. I knew no one else in Rabatha. All I had was him. “I am glad to meet you,” I said. Suddenly the weight of it all bore down on me. I felt tears well up. Oh, it was awful; the shame of it was a force to drown in. I wrapped my arms around myself and stared at the ground. I nodded and somehow managed not to cry. I felt I would die if he saw me cry, if that was the first thing about me he saw. He took me gently by the elbow and led me down the street. “I have had long days, too,” he said. * * * * *The next morning, I woke facing The Reader. The actual painting, the original. At first I thought it was a dream. When he is not working the assembly line, my father is an artist who specializes in portraits. He is something of an expert on the Nahsiyya Movement. He has copied The Reader himself for at least a dozen dignitaries. He invented a press to print paintings with a high level of fidelity. He prints books of art, and his books end up in Qin libraries all over. Every one of those books has a print of The Reader in it. In short, I was extremely familiar with this particular painting, this monstrously famous painting, which inexplicably hung on the wall in a cramped set of rooms in an elvish ghetto. Food sizzled in the kitchen, and it smelled slightly strange. I crept out of bed, barefoot and timid, and studied the painting, which my father himself had seen only once. It had hung in a gallery in Tarquintia for a fortnight many years ago, and my father spent all of his money to get there and see it. He wanted to drink it in, absorb it, let it burn into his mind so he could replicate it again and again. No one was entirely sure what had happened to it after that. No one besides me, Dirva, and the artist. My father’s copies are excellent copies, but they are still copies. The copies couldn’t quite show the way the bold lines captured movement and obscured it at the same time. The palette was brighter than in the copies—the blues and the greens burned bright and ice-cold at once. I think it might have been a matter of the medium, of his use of ink instead of oil paints. The paint gave it a dimensionality lacking in the prints. The artist slapped it on thick, in ridges that cast subtle, shifting shadows. The shadows made the subject look like he was breathing, like he was just about to turn the page. I studied the figure: a black-skinned boy with black hair and green eyes. He wore a subtle smirk. He had broad shoulders and long, graceful fingers. It was a face I’d seen a thousand times before, and it dawned on me as I stood there that it was a face I had seen the day before. “I…yes?” I said, though it came out closer to a question. He glanced at me quickly. His eyes were overly expressive; you could tell precisely where he looked. He is a reserved man, but his eyes give him an air of penetrating intensity. “Yes?” Again it came out like a question. “Ariah. Please, just ask it,” he said, turning his attention back to the stove. “I am sure it cost quite a lot to smuggle it, yes, but it cost me nothing. It was a gift.” He turned away from me. He opened his mouth to change the topic. He froze. His eyebrows knit together, then he sighed and looked over. “Your father is an artist. He mentioned that. You know about art. Yes. It’s me.” He pulled the skillet off the stove and emptied the contents into a bowl. He gestured at the table and laid out flatbread for each of us. I sat across from him and scooped up some of the potatoes and peppers in a bit of flatbread. They had been spiced with something uncommon in the Empire, which was not bad, but was unfamiliar. I couldn’t help but stare at him. It was him, undeniably him, but he had none of the magnetism or quiet enthusiasm of the figure in the painting. The sharpness was there, the quickness, but in the painting, as a boy not much older than myself, he looked happy. Across the table, as a man approaching middle age, he seemed mostly irritable. How did one grow into the other? As I’ve mentioned in other posts , Ariah is set in the same secondary universe—Aerdh—as many of my other pieces of fiction. 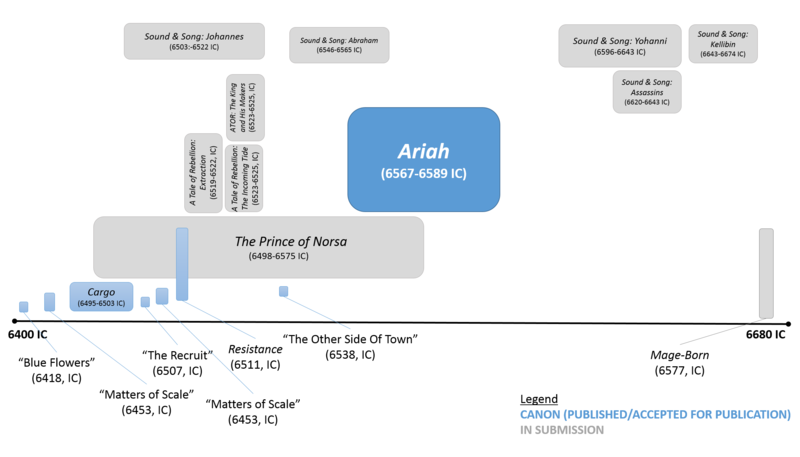 If curious to see where Ariah fits in chronologically to those other pieces of Aerdh-based fiction, check out this handy timeline I made below! The width of the boxes above corresponds to the timeline below: longer boxes mean the story covers more years. The height of the boxes corresponds to the word count of the piece: taller boxes mean the story took more words to tell. 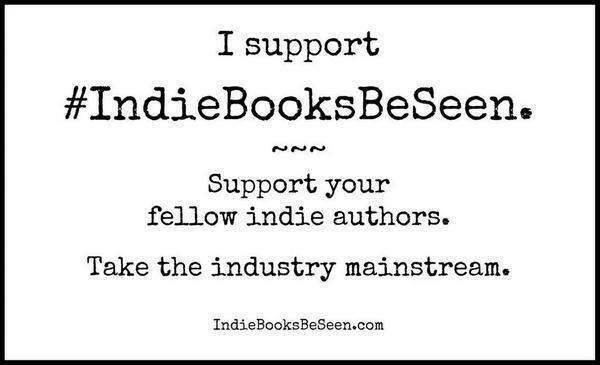 The blue boxes are “canon” works—those which have been published or accepted for publication. I consider something canon when it’s accepted for publication because that’s the point at which I stop fiddling with it, and it becomes a fixed point in the world of Aerdh; these works serve as scaffolding, or the ‘bones’ of the other works. 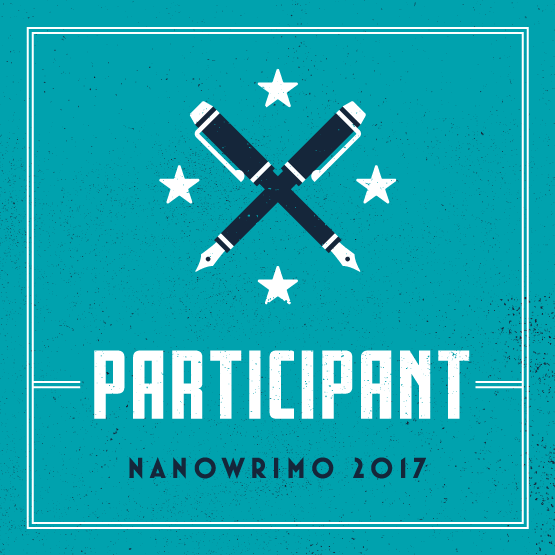 The gray boxes are unpublished works that are ready or very nearly ready to be submitted for publication. 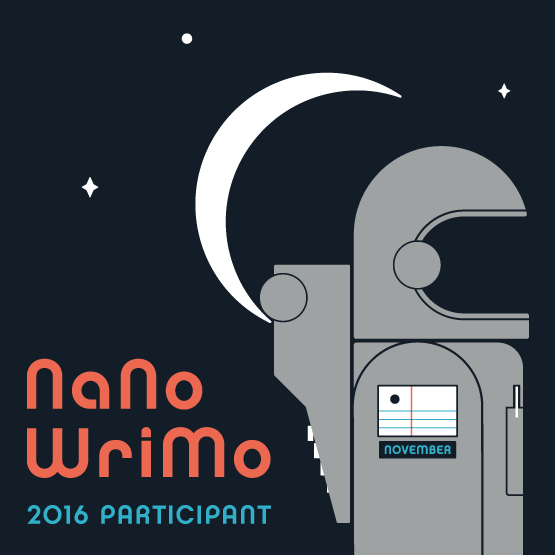 They’re included to give you a sense of scope and the degree of overlap between my Aerdh-based fiction. A defining trait of Ariah is the presence of magic. It’s a key element of the world of Aerdh, the book’s setting, and it’s a defining feature of the titular character. The fact that Ariah is, among other things, a magical creature, gets the narrative going—the book starts with him seeking out a mentor who will guide him to mastery over his magical gifts. Such training is traditional for Semadran elves like him, and his particular combination of gifts are rare enough that finding a suitable mentor takes him far from home. Ariah’s gifts are strong enough, formidable enough, that he eventually must take on a second mentor even farther from home to fully understand himself. Writing fiction is an art defined by choice. 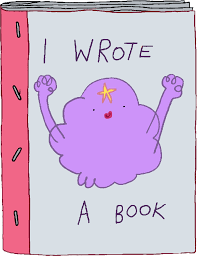 So, what drove my choice to weave magic into this book, and to place it so prominently? What makes magic, as an idea, valuable to the reader? And what makes magic, as a fact in Ariah’s world, valuable to him and those around him? The truth is that magic as an idea is only as valuable as I make it to the reader and to Ariah. It is a clear case of “show, don’t tell.” I can tell you it’s valuable—but unless I shore up that claim with worldbuilding and details and narrative tension then you, as the reader, won’t feel that value. It won’t add anything to your experience of the book. For Ariah, the value of his magic is a double-edged sword: on the one hand, it grants him great insight into those around him. It makes him prescient; it makes him astute. Given his social position as an elf in a Qin-led society, there is value in this. Anyone who has ever been marginalized knows that it pays to pay close attention to those in power. It’s always useful to be the most knowledgeable man in the room. Over the course of the book, his magic saves his life and others’ lives quite literally. But there is a danger to his magic, too. As protective as his magic can be, the use of Ariah’s magic has the potential to get him arrested, impressed into military service against his will or rejected by friends and loved ones. The use of it sometimes comes at a steep cost for complex, layered reasons: issues of personal privacy, issues of cultural confusion and purity, issues of outright oppression. All of these things weigh on Ariah’s mind in the moments when he must decide when to use his magic and when not to. For me, a recurrent theme in Ariah is the toll exploitation takes on marginalized people. This is best captured in the relationship the Qin Imperials have towards the Semadran elves’ magic—they use it, constantly, to improve the Empire, but berate it, constantly, as unclean and impure. Elves with a facility for what is called patternwork (something akin to real-world engineering) are assigned work in research laboratories and paid a pittance to design bigger, better factories and military machinery. Those elves continue to live in the ghettos while the Qin profit off their magically influenced creations. Ariah and his mentor, Dirva, get work as linguists, helping to translate in diplomatic parleys between far-flung ambassadors. That Ariah and Dirva know these languages and can learn them extremely quickly due to their magical biological wiring only seems to matter functionally insomuch as it means they can be paid very little. The Qin have evolved religious reasons why magic is impure. Rationales always spring up to explain away injustices and support the status quo; this is a social fact. By the time Ariah tells his story, these rationales have been ensconced in law, codified and enshrined. His life is structured such that the Qin are able to get the maximum value out of his magic while he reaps the least amount of profit from it—because he is impure for having magic in the first place. But magic, because it so totally shapes how Ariah perceives and relates to the world around him, also becomes a primary means of his small acts of resistance against the system exploiting him. In the doing, Ariah exists in that tension between the value and the danger of his magic for much of the book. Much of Ariah is set in the capital city of the Qin Empire, Rabatha. This is where Ariah receives his training with his mentor Dirva. This is where Ariah inevitably returns—twice—after living elsewhere. This is, for a long time, where Ariah calls home. Rabatha is a bustling city, a place of great political clout, nestled in the heart of the desert Empire. It is an urbane city: universities, libraries, art galleries, exotic markets, the very first clockwork train station. It is the jewel of the Empire. And it also has ghettos. Ariah, because the Qin have deemed his skills useful to a point, is able to catch glimpses of both sides of Rabatha. He lives in the Semadran districts, but he works in the Qin areas, so he sees this contrast between how his people are forced to live compared to the Qin. short time, in Fez, Morocco. I spent time there as a study abroad student in a program focused on cultural psychology; half the time in the program was spent there, and the other half of the time was spent in Tartu, Estonia. It was an immersion program—we learned what we could of the languages (I was terrible at that) and had homestay placements. We took history courses and modern culture courses. We were mostly white college students, and we were cultural tourists, and we bore our immense privilege on our sleeves most of the time. I am exceedingly grateful for the experience. Morocco stuck with me. It has a deep and fascinating history—every place does. But something about it really stuck with me. My homestay placement was with a family who lived in the new part of the city, the part of the city that had been built by the colonial French. They lived in a beautiful modern apartment—top floor, overlooking the entire city, with a beautiful view of the mosques with their reaching minarets. I remember the building had a doorman. I remember feeling some class shock at that growing up the way I did in the States. I spent most of my time in the medinas, the old city, with its winding narrow streets with walls so high it seemed always in perpetual twilight. The medina was the original Fez, but when the French took the city they forced the Moroccans to move there—all of them. It became a ghetto. It still is a ghetto; the people there are uniformly poorer than the family I stayed with. Poorer and more traditional—the women there wore hijabs; the women in the family I stayed with did not. But it gets more complicated than that. If you dig further into the medina, you find the mellah. There was a period when Jews lived in Morocco, and at that time, they were forced into ghettos of their own, these small pockets of blue-washed walls where they were separated from the rest of the population. They are haunting places. I think about these evolving relationships—new city, old city; new city, medina, mellah—quite frequently still, ten years later. It was this complexity I wanted to capture in the fictional city of Rabatha. Hi friends! Today I have for you a tour of the book’s cover. This Prezi calls out why certain elements were called out in the cover art and the relevance they have to the story. I want to thank C. Bedford once again for her incredible art! We are a week out from Ariah’s release! Not that I’m counting the days or anything. Not that I have a series of posts labeled “Countdown” or anything. The action is driven by relationships, by love, and the ties that bind friends, lovers, and families together. Ariah’s journey uses a carefully crafted fantasy world to explore the influence of deeply entrenched and often narrow social rules, expectations, and traditions and how those rules end up shaping our lives if we allow them to. Sanders writes compelling personal struggles in a detailed, fantastic setting. The themes of queerness, family, and belonging will speak to a lot of people. Set in a beautifully crafted fantasy world where races of elves uneasily coexist, and most are under the dominant hand of the brutal Qin, this poetic coming-of-age saga is focused on relationships and how “all of us exist in a web of other people, tethered to them and pulled by them this way and that.” The elf Ariah is apprenticed in a strange country to teach him control of his two magical gifts: perfect mimicry and the ability to read and shape the emotions of others. He trains with Dirva for several years and is groomed to be a linguist like his teacher. But what could have been a mundane life of good-enough takes a turn toward the extraordinary when Dirva is called back to his home country and Ariah accompanies him. That’s when Ariah’s real journey begins, as his training ends abruptly and he develops the relationships that will become critically important in his life. 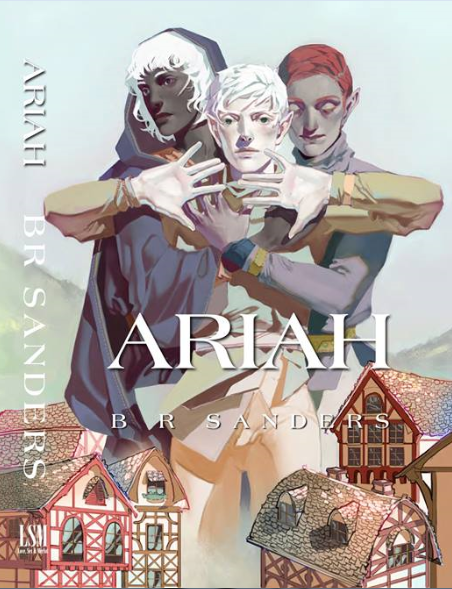 Moving from obedient and docile to reckless, self-sabotaging and disastrously unformed, Ariah is a marvelous protagonist whose mixed blood sets him apart even in the elvish ghetto. There are bandits and pirates and elven queens and magic; treks across the desert, brutal slavery and racial discrimination. The author’s skill at blending classic elements makes the story fresh and exciting. Splendid prose and an absorbing story are built on realistically complicated, well-developed characters and relationships, and the explorations of pride, vanity, humility, love, philosophy, and sexuality make this vivid tale of Ariah’s journey towards maturity a must-read. Ariah has an official release date: May 28! The fine folks over at the Zharme Publishing Press have already pre-listed it on Amazon, which means you can pre-order it in either ebook or print format! How exciting is that?? BUT, if you would like a sneak peek, we are hoping to launch the book with between 5-10 reader reviews up on Amazon on release day! We have eARCs (electronic Advanced Review Copies) available for interested readers/reviewers. If you’re interested, please email me and let me know if you would prefer a pdf, mobi or epub version of the book! Ariah’s magical training has been interrupted. Forced to rely on a mentor, Dirva, who is not who he claims to be, and a teacher who is foreign and powerful, Ariah is drawn into a culture wholly different from the elven one that raised him. As his friendship with Dirva’s brother blossoms into a surprising romance, and he slowly learns how to control the dangerous magic in his blood, life finally appears to be coming together for Ariah—but love and security are cut short by a tyrannical military empire bent on expanding its borders. War, betrayal, passion, and confusion follow Ariah as his perilous journey leads him beyond the walls of the Empire, and into unfamiliar territory within himself. Along the way, he’ll discover just how much he’s willing to give up to find his place in the world, and he’ll learn what it means to sacrifice himself for freedom—and for love.